Whether it’s the Tower of London or the famous Bastille, your only means of escape would be to steal the jailer’s keys. This great set of antiqued keys has been forged in metal like the originals and is a great conversation piece or accessory to an outfit. 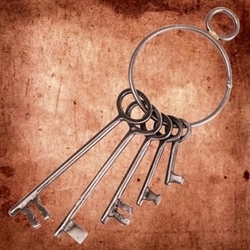 Set includes 5 keys of various styles ranging from 2-1/4 Inches long to 6 Inches on a large 3-1/2 Inch steel ring for easy carry or hanging on that peg in your dungeon. Perfect accessory for the Middle Ages through the Old West.